Welcome to Shenzhen! I assume you manage to get your China visa sorted by now eh? If you read our post here about how to get to Shenzhen from Hong Kong, I did tell you a brief general view about Shenzhen and what makes it famous. They do have many theme park but the one that makes Shenzhen famous is their miniature one, to be exact is their Window of the World. 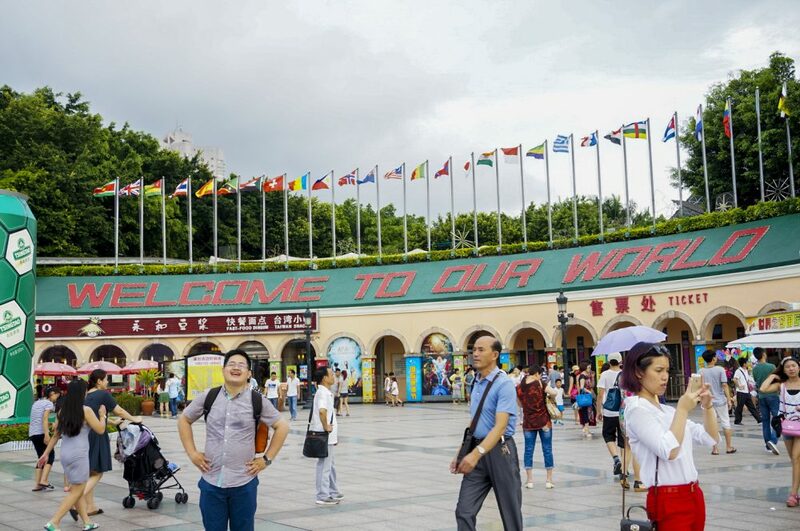 Basically, it is just the literal translation of the name, there is around 130 miniatures model of world’s famous landmark scattered around the park. 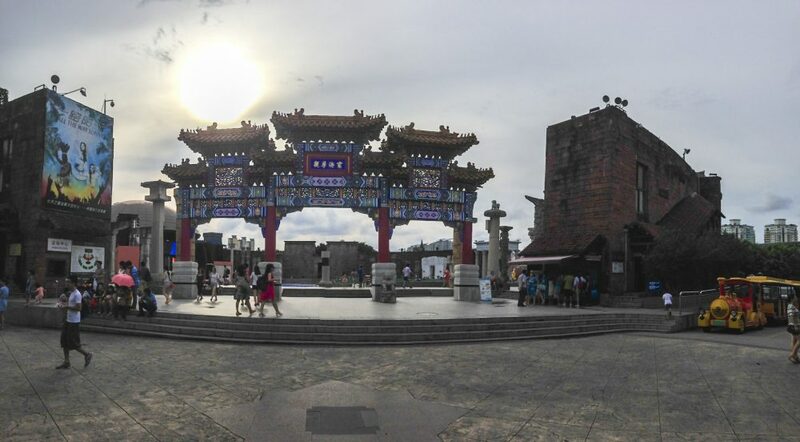 As the number one tourist attraction in Shenzhen, it is easy to get here, especially if you are coming from Luo Hu by MTR/ subway. Luo Hu MTR station is actually connected with Shenzhen MTR station, you take the Luo Bao line (line 1) and get off at Window of the World (Shijie Zhi Chuang) station. The MRT journey from Luo Hu – Windows of the World only takes around 35-45 mins time and cost about 5 RMB. Another option is either going by bus or taxi, but MTR is definitely the easiest. Once you arrived there you will straight come out from the Louvre as it is the MTR exit point, quite a grand entrance in my opinion. 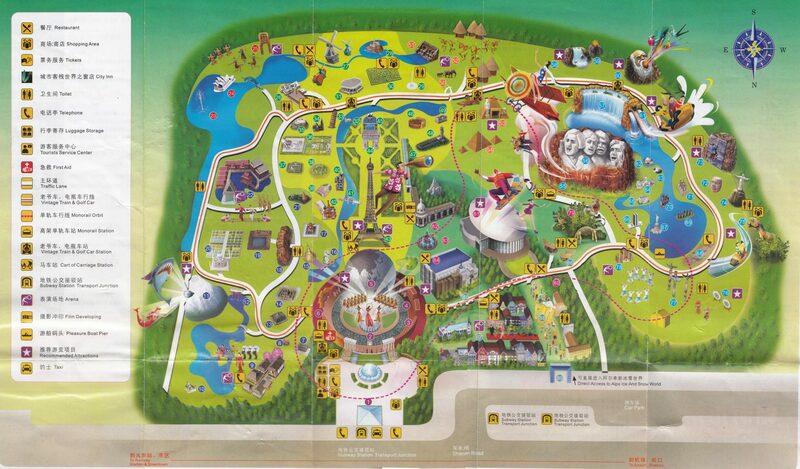 The entrance fee is RMB 180 (the last time I went there) and the park open from 9am – 10pm daily. They open a bit longer until 11.30pm on the holiday season. After you passed the entrance, you will see a huge open stage with the Eiffel Tower in the center which called the Global Stage. The park starting point is on the left, so you will need to go around this stage. 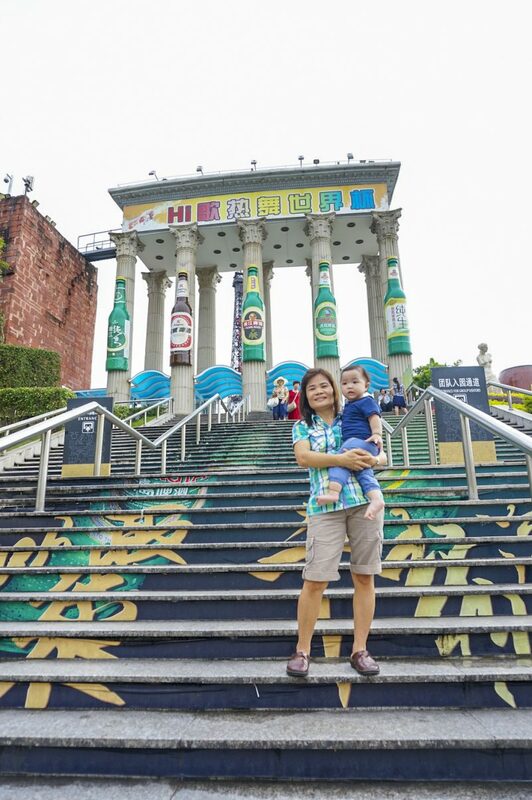 You will pass this huge barrel and 1,680 square meter relief wall until you reach the ancient Chinese gate. That is where the actual park begin. Once you passed the gate you can just start exploring or you can turn left to rent your transport to go around the park. You will see many people lining and wait with a line of the mini train, golf cart, scooter and that is the place. Walking not too far to your right is the souvenirs store. Still in this area is where you can find all the stall selling snack like ice cream and stuff. In fact, you will see one right ahead from the gate. The park is divided into 8 main part. Square of the World, International Street, Asia Region, Europe Region, Africa Region, Americas Region, Oceania Region, and Garden of World Sculptures. Most the names are obvious as the name suggest. Divided according to the region of the landmarks itself originated. Square of the world or World Plaza is the entrance area of the park. Global Stage, Eiffel Tower, relief wall, the huge barrels, all located in this area. See below map. Square of the world or World Plaza is the entrance area of the park. Global Stage, Eiffel Tower, relief wall, the huge barrels, all located in this area. See below map. International Street is actually located outside the main park. 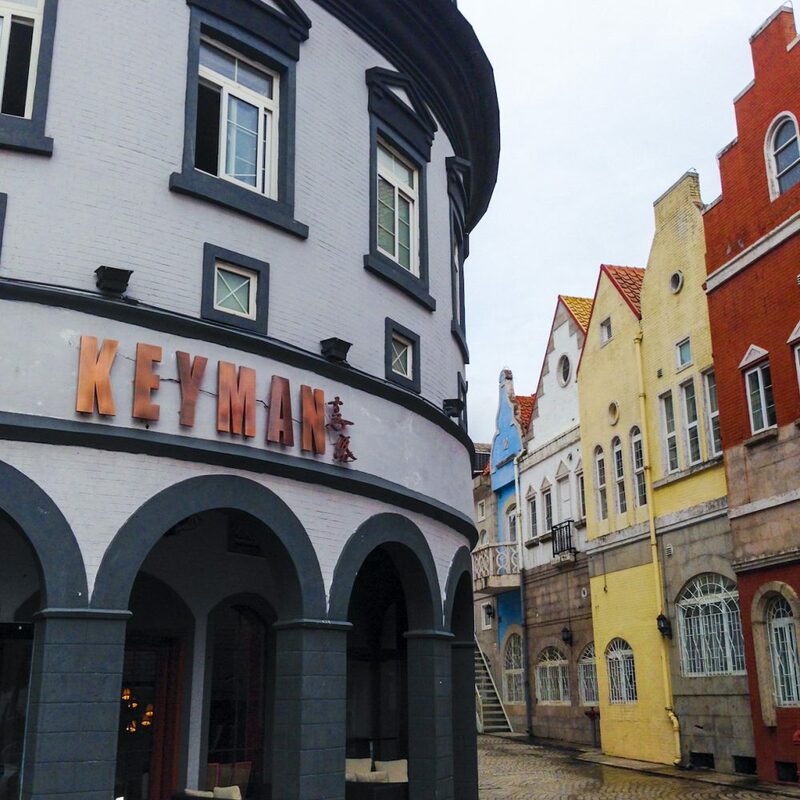 It is a street with a different style of buildings from all around the world which makes you feel like literally walking on the “International” Street. The Garden of World Sculptures is located next to International Street. Again, as the name suggest it is a garden full of hundred of world-famous sculptures. As a 48-hectare park, its can be quite a long way to walk around the park by foot. They do provide a couple of alternative about that, you can rent a golf cart with a driver or mini scooter for 2 people. If you are going with big groups then you can rent the mini train. But going with a rented car can have its own downside which is kinda our experience. Between going by foot or rented car I will say depends on your preference and time, if you prefer going at your own pace and have a whole day to spend then go by foot. But if you have a limited time here then just rent a car, they will show just the most popular landmarks for you. They also have a couple of other rides and shows that mostly required an additional fee. Rides like a roller coaster, flume ride, 4D movie, skating rink, etc. Not really a must do for me but if you have more time to kill then why not. The same goes with their shows which you can check all of their schedules on their website here. After all, their main selling point is the miniature models itself so you won’t miss much if you pass all the shows. You might get quite skeptical about this place. But, to be honest it is quite entertaining just to stroll down the place seeing all the replica. There is some replica which looking a bit dull and obviously lack of maintenance. Some look pretty realistic in the scale down version of the real ones. My advice is spare some enough time to enjoy the park, it will take at least 4 hours to cover all the main attraction. But hey, it is a miniature park anyway so take your time feasting your eyes and feeling like a giant in a small world. Moreover, if you like taking picture or #selfie then you will probably like this place more than you think you would. This place proves that seeing the entire world is not as impossible as it seems. Start with the smaller ones, right ? Share this post with someone that you know would want to see the world 🙂 Keep traveling everybody, cheers! Find your hotel in Shenzhen with discounts. Or if you prefer that Shangrila mentioned in our story. Explore Shenzhen in great adventures. Last but not least, don’t forget to travel safely. Get your travel insurance. Learn more how you can get protection. wauw, wat goed gezegd! Inderdaad, je wordt zo beinvloed door alles wat je om je heen ziet, en al die perfecte leventjes (wat altijd zo perfect op de foto lijkt dan ;)) die je op facebook en instagram voorbij ziet komen. Maar je moet gewoon blij zijn met wat je hebt! Ik vind het altijd belangrijk leuke dingen te plannen ook Ik sta eigenlijk te weinig stil bij die kleine dingetjes! Heel erg bedankt! We vinden het jammer dat we kunnen Nederlanders niet goed spreken, dus we proberen te beantwoorden met behulp van Google Translate. Ik hoop dat je kunt begrijpen. Hoe dan ook, bedankt voor commentaar.